Weathervanes are the perfect addition to any outdoor space; not only are they attractive, but they are extremely durable and require little to no maintenance. 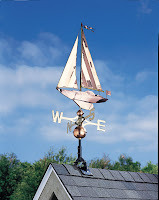 Caring for a weathervane can be surprisingly easy and virtually maintenance free. The correct way in which to care for your weathervane greatly depends on its construction materials. Generally, weathervanes are constructed of rust free, weather resistant materials such as copper or cast aluminum. Polished copper weathervanes are not treated and, as a result, within a few months it will begin to naturally tarnish, like a copper penny. Eventually, the surface will begin to change to a beautiful and natural patina. If this is not a look you desire, you can use a clear lacquer or polyurethane to protect and maintain the polished finish. For basic cleaning simply use a mild soap and water – other cleaners are not necessary. Copper will naturally patina over time and develop a warm medium color. Unless you want to maintain a shiny copper finish, do not use copper cleaners. Do not use abrasive materials or harsh chemicals as these can harm the surface. Decorative items should be kept clean and dusted. Copper is sensitive to air, and oxidizes (tarnishes) faster in moist air. Coating with lacquer, such as StayBrite Copper and Brass Polish, helps preserve the finish. These darker finishes have gone through an “accelerated patina” process and will not change much more relative to the lighter finishes. In this case, an artificial finish is applied to give the weathervane the appearance of an antique. This finish will maintain its color, as it has already oxidized, and requires little maintenance. Should you wish to clean the product, do so using mild soap and water only to prevent removal of the decorative blue-green patina finish. Cast aluminum weathervanes are constructed of solid aluminum and coated with paints that have been specially formulated and weather tested to withstand the harshest elements. Minimal cleaning and maintenance are required. Cast aluminum is constructed to last and will stand the test of time. Clean using mild soap and warm water and dry completely.